A self-described "intellectual circus," TEDMED coalesces leading thinkers and practitioners from health and medicine with those in technology, entertainment, and design (TED). This always sold-out event costs $5,000 to attend, but a contribution from the Association of American Medical Colleges has allowed medical schools like Emory's to simulcast the event. Find out what TEDMED is and why becoming a part of the community is truly a life-changing experience. See the world's most creative minds talk about the future of health and medicine. Technology/Entertainment/Design (TED) conferences have engaged the world since 1984, bringing together people from different disciplines, and growing into a global force for innovation and creativity. Otis Brawley, MD, Medical Director of the American Cancer Society and Professor of Hematology and Medical Oncology. 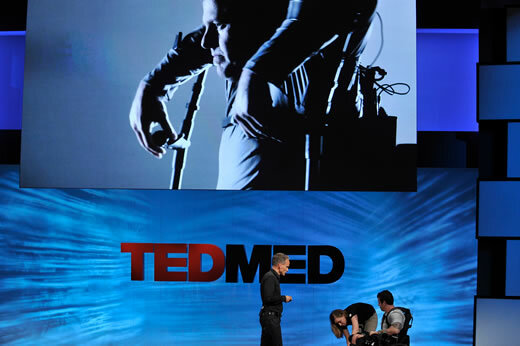 TEDMED includes 11 two-hour sessions, each with 10-15 speakers who only talk for 3-15 minutes. But the conference is about much more than a series of exciting talks. Each TEDMED talk is a short, powerful story all about a single idea – a counter-intuitive idea that will touch you on a personal level, penetrating your preconceived notions to shape your thoughts. Every year, new members come for the big name speakers; but they leave talking about the ones they have never heard of in a field far from their specialty. TEDMED celebrates the horizontal mind, not the vertical silos.